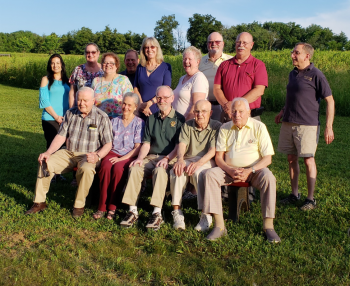 On Thursday, June 21, 2018 the Kennett Square Lions Evening Club and Morning Branch Club met for their end of the year dinner and awards. The location was the Kennett Township Barkingfield Park, a pedestrian and dog park established during the past two years. Dinner was held in a new pavilion erected by the Township and the Lions gathered posed for a photo next to the pavilion. Past President Ray McKay received the PA Lions Councilor’s Award, presented by Past District Governor, Charles Finney, who traveled to Kennett to join in the dinner and present the award. Past President Ray McKay awarded Lion Bill Landmesser a Bing Miller Foundation Fellowship for his longtime service to the Club and Community, and current President, Nathan Schenker, presented the Lion of the Year Award to Lion Debra Schwepfinger, for her support, time and efforts on behalf of the Club. 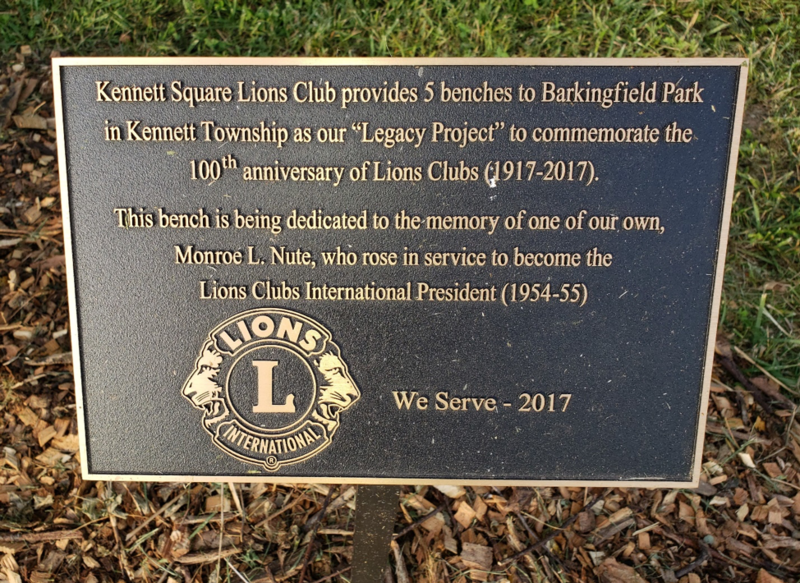 Barkingfield Park was chosen as the location for the dinner as it is the location of five park benches donated by the Kennett Lions as their legacy project, recognizing 100 years of the existence of the Club, 1917 -2017. Past President Ray McKay was chairman of the legacy project which was completed earlier this year when Kennett Township placed the benches and plaques. The main plaque recognizes Monroe L. Nute, a Kennett Lion who served as Lions Clubs International President 1954-1955. 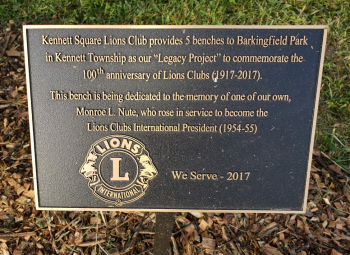 As the culmination of the evening, a group of Kennett Lions gathered at one of the park benches to officially dedicate the legacy project.